Contact me on email (preferably) or call +7 916 172-4710 (14:00-22:00 Moscow time). Big construction and repair manual (schemes, figures, algorihtms, reference data, etc. ~2000 pages, zip-archive with PDF files, 44 Mb). Buyers guide (RTF, in Russian) - print this file and take the printout with you before buying a used Feroza. List of used spare parts on sale/exchange. List of needed spare parts . Rules of payment, shipping, and damage assessment. this vehicle profile on DRIVE2.RU. Illustrated tuning report at "Proexpedition"
Small body-on-frame car, redesigned from high-volume produced Japanese offroad vehicle purposed for police, foresters, generals and other state usage. Carburettor was replaced by injector in 1991. Modifications in F300/310 body were called Feroza (left-handed drive) or Rocky F300 (right-handed drive). It's an excellent choice for those aiming at dedicated usage of an OFFROAD vehicle, but nevertheless capable for city usage. Moreover, one of the cheapest offroaders. Taking into account that production ended in 1998, the owner is required to have hands:). Compared to modern cars Feroza is low-maintenance, easy repairable, simple bith in construction and in service (including self-service). New spare parts cost approx. the same as for other Japanese cars, but available (in Russia) in capitals and far east only. Used spare parts are available only in clubs like ours:). Service and maintenance are well documented in a detailed manual. The car allows usage of russian spare parts in some cases, at least for a short "return-home" period. The injector is not so comprehensive as it happens nowadays, about ten sensors in total. Almost no electronics. Suspension seems to be "unkillable". Instant necessary repair happened approx. 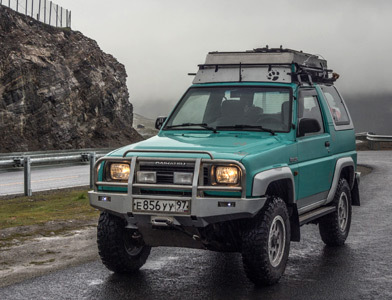 once per 30,000 km (including off-road): clutch disk, wheel bearings, muffler, some electrics. I perform preventive service and rundown parts replacement regularly, without waiting until it breaks (which I consider normal for a twenty year old car intensively used off road). For the first five years of usage, planned and instant spare part expences have been approx 8,000$ (including tyres and consumables, but no petrol), the car itself cost 6,000$ in 2005, the offroad tuning and upgrade were approx 6,000$ in total. Recently I got a second engine and brought it to "almost-new" condition (mechanical work and spare parts were 4,500$, which is a slightly more than native engine capital repair). Due to self-made repair, I have spent no more than 1,500$ for service work for seven years of owning. Geometrical cross-country ability is excellent. Road-grip ability is good (front axle is coupled to part-time transfer box with low gear and without differential; rear differential is limited-slip, front differential is free, however Kaiser locker is available). Suspension articulation is excellent at rear, and acceptable at front (and becomes good after lifting). Axle bodies and frame crossbars are extraordinally durable, allowing contact to ground/stones without consequences. On stock tyres motor torque is enough for most applications except sand and deep snow, while bigger tyres require usage of low gear or passing obstacles on the move. On air-chamber-equipped HD-E engine the torque has two peaks, at 3,000 rpm and at 5,000 rpm. For on-road condition only rear wheel drive is recommended (part-time transfer). 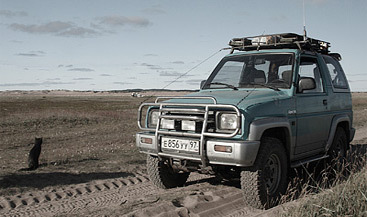 On-road ability is typical for an off-road vehicle, mainly due to full-profile tyres and long-stroke suspension. Comfort on-road speed is 90-100 kph (the car is designed for something other than asphalt racing:) ). Comfort level is typical for utility vehicles, however Japanese ergonomics can not be poor - everything is on its place, and there are no unneccessary modern idiotisms like rain sensor or smart indoor lighting:). The room inside is enough for two people and luggage (or three people with one backpack each). With onroof luggage basket and removed rear seats we carry the following stuff: two sandtracks, a hi-jack, a tent, a rubber boat, three big canisters, 40kg tools∂s box, a chain saw, two backpacks, a big soft bag with sleeping bags, blanckets etc., 12L fridge, a winch anchor, a heating device, 100m or rope, and a 20kg food box. Body: everything is mounted on a frame, including a cabrio-type body (all top is plastic, except windscreen frame, central pillars and rear safety frame), metal bumbers, stock undershields for engine, transmission and fuel tank. Empty weight is 1200kg, offset is 22cm at lowest point (rear axle). Suspension: unsplit rear axle mounted on leaf springs; double front cross-arms mounted on torsion bars; front stab bar. Typical tyres are 235/75 R15; acceptable after-lift size is 32", unless a major construction change is applied. Engine: 1.6L four-stroke R4-type, installed longitudinally, distributed injection (in manifolds), 95 h.p. at 5000rpm, 130Nm at 3000-5000 rpm, 16 valve SOHC with rockers, camshaft belt, visco coupled fan. Stock fuel tank is 60L, with external fuel pump. Average on-road consumption is 9-12L (pre 100km) of standart petrol (but octane number 76+ is also acceptable. If you read that in English you have probably never met such prehistorical fuel on the market:)). Transmission: wire clutch drive, manual 5-speed transmission, manual 2-speed part-time transfer (ratio 1 and 1.8) with equal torque distribution, manual wheel hubs, limited slip rear differential. Steering and brakes: power steering, screw-plunger-sector type reductor, adjustable column. Two brake circuits (front-rear), front ventilated discs, rear drums. which may or may not be present: ABS (1996+), air bags (1996+), air conditioner, rear LSD, full-time transfer (with lockable differential but without low gear), automatic wheel hubs, three-stage dumpers, oil radiator, bigger visco coupling and fan, second heater, power windows, power mirrors.